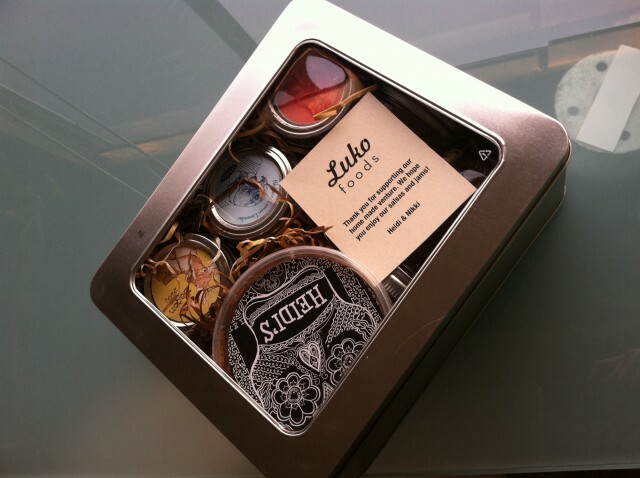 I was recently introduced to a fantastic new food company called Luko Foods. I know the owner, Heidi, through a good friend of mine but had no idea she made some of the most incredible salsa on the planet! She is of Mexican decent so she’s been around her fair share of tasty salsas growing up. Her business partner-in-crime Nikki, also brings something to the table with her decadent jams. Seriously, these jams will knock your socks off. Because I….”know the owner,” Heidi did a personal drop off and this is what arrived at my door. It was a beautiful, tin-box of love. Look at that presentation! It was like Christmas morning and I couldn’t wait to dig in. When I first tried Heidi’s Salsa, I literally could not stop shoveling it into my mouth. I barely saved enough for my husband to try. Her salsa was SO incredibly fresh and had the perfect amount of kick and cilantro (my favorite herb). And no joke, I drank the rest of it from the container. Yes, I have a problem. In the first bite, I felt like I was transported back to Mexico where I’ve had some of the most delicious food over the years. All I needed was a margarita and I’d be set for life. No wonder her salsa won 1st place at The 30th Annual Los Angeles Farmer’s Markets Celebration salsa contest. Heidi has many kinds of salsa and is always experimenting focusing on what’s local and in season. I’m dying to try more, but I’m not sure how she can compete with her “original recipe.” It’s a salsa I can not live without. The next morning, I decided to make waffles. No, I didn’t put salsa on them, but it was a perfect excuse to try out Nikki’s Jam. On half of the waffle I use the Blueberry Lemon Lavender and on the other half I used the Bacon Maj. Let me tell you, the combination was mind-blowing. I started with the Blueberry Lemon Lavender and at first, my mouth didn’t quite know what to do…except beg for more. I was a little sceptical at first because lavender is usually something I experience on the massage table in a body oil, not something I ingest. Well, this jam proved to be one of the best jams I’ve ever had and I know it will be a staple in my kitchen. I loved the complexity of the sweet and sour combined with the fragrant lavender. It all worked together so well that the written word doesn’t do it justice. You have to try it. 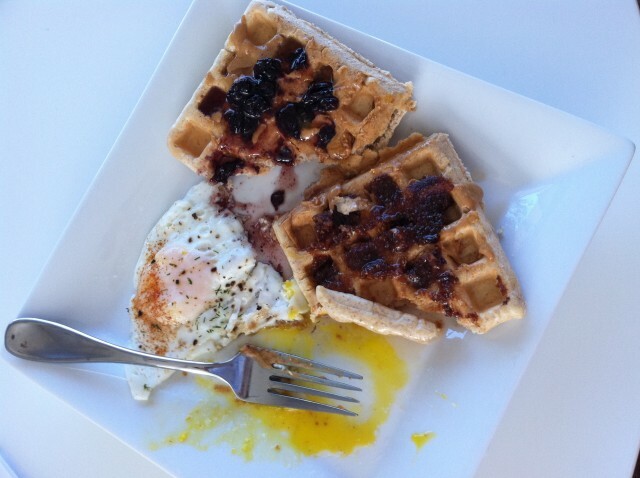 Next, I tried the Bacon Maj. Because I was serving my waffles with a side of over-easy eggs, I assumed this jam would be delicious because bacon, eggs and syrup are “matches made in heaven” anyway. I didn’t have bacon at the house so the jam was the next best thing, and it did NOT disappoint. I’ve always loved the sweet and savory combo so to me, this was a no-brainer. The slight saltiness of the bacon jam together with a touch of REAL maple syrup, made this one of the most memorable homemade brunches I’ve had yet. I know these jams will be a “must” for weekend brunch in my home and I encourage you all to give them try. You can find Heidi’s Salsa and Nikki’s Jam at at few Los Angeles Farmer’s Markets or you can order online at www.lukofoods.com. Ok, now my stomach is growling. Gotta go eat! what an absolute honor to be featured on natalie forte’s blog!! and with raving comments, at that! from one food lover to another – thanks for the mention! YUM!! I must order online TODAY! Thanks for such a colorful and mouthwatering description of these new “soon to be” staples in my kitchen too! Plus, I’m ONLY supporting privately owned businesses every chance I get — Keep bloggin’ Natalie J. Yes, definitely try it! My local arfmer’s market is the one in the Inner Sunset in SF . 9th and Irving. Not very accessible to BART, but right off the N line (muni). They make some really delicious stuff currently, I’ve been using their sweet pickled jalapenos in everything from beans to pizza. Plus, the bangles are VERY nice. If I were your niece, I’d be SUPPPERRRR happy with that! They’re glam but also understated. Thanks for checking out my post!